The easiest way to appreciate super resolution is to see it in action. Below we have 3 versions of the same image. The first is a small image of a butterfly. The second image is enlarged by 2 times using a classical method called bicubic resampling. The third image has been enlarged 2 times using super resolution. As you can see, the super resolution process provides a much sharper image that stays true to the original even when doubling the size. At PosterBurner, our job is to take our customers’ images and turn them into great - and often very large - prints. To do this, we need to take the original image and increase its size dramatically before printing. If the image is not large enough, fine details get lost and the print can become pixelated. We hate pixilation in images. This is why we are so interested in a field of artificial intelligence research called single image super-resolution. 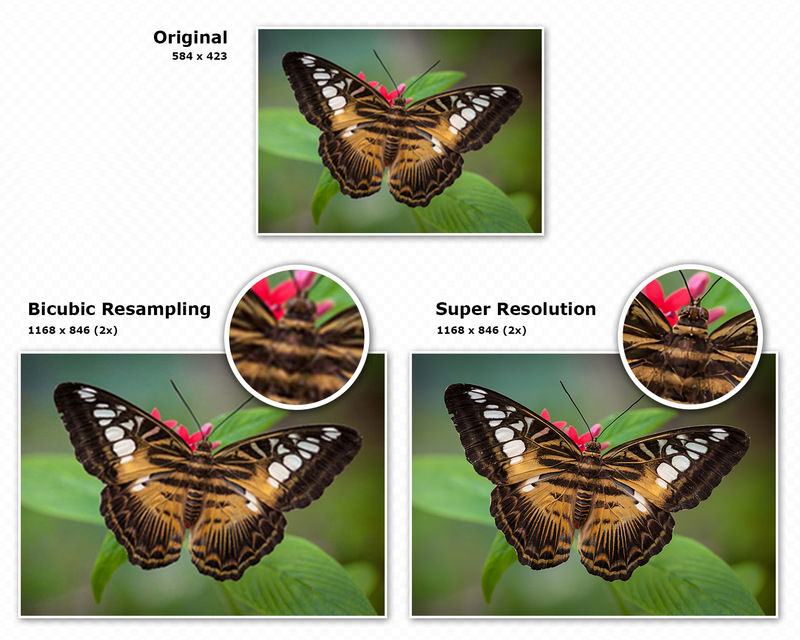 The classical way to enlarge an image from its natural size to printing size is called resampling. Resampling uses advanced formulas to create more pixels as the image grows larger. The formula used in resampling considers nearby pixels and tries to estimate the color value of the new pixels. What makes super resolution so much better than resampling is that it smartly paints those new pixels as the image grows larger. The super resolution process is trained on millions of images and it learns what a small image should look like as it gets larger. Super resolution models can be trained on general images, or even be specialized to niches such as cartoons, team photos, headshots, or any other image type. Neural networks are used in the training and each image is broken into a matrix of numbers that represent each pixel in the image. The AI algorithm learns the image features when it is small and when it is large, and learns how best to turn a small image into a large image. While there are technical ways to judge how well a super resolution method enlarges an image, those ratings have very little to do with what we are interested in - which is to get the best looking image for printing. While best looking image is subjective, you can see that the super resolution image is much sharper and will look much better on the wall than the other two images. We have spent years developing and training our model and when you get your custom poster, decal, canvas print or any of our print products, you are getting a state of the art image enlargement that increases the quality of your final print significantly. We are on and will stay on the forefront of this machine learning revolution to make sure our prints are the best you will get anywhere.